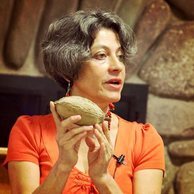 Ethnobotanist and Healer, Rocio Alarcon - Living beings have over time developed through different processes (evolutionary and environmental) a variety of relationships with different plant species the world over. In this set of relationships, there is a movement of conscious intelligence through energetic (electric, magnetic) forces, that allow the entrance, or exit of this plant intelligence, in order to benefit us and bring us into a state of a movement expansion and complete ecstasy. There are many such plants that are found naturally in the environment where we ourselves have also grown up and evolved. However, there are also other plants that are present in the landscape, due to the movements of human beings. Rocio here explores plants of the Basque Country (Spain): where complex Artemisias with different species such as Absinthium and Annua, can be found along with other powerful plants such as Yarrow (Achillea Millenfolium), and Feverfew (Tanacetum Parthenium). An Ethnopharmacologist, Ethno-botanist, shamanic practitioner and extraordinary teacher and healer, Rocίo has spent over 30 years working with ethnic groups in the tropical rain forest and Andes Mountains of Ecuador and in the Basque Country, Spain. She has contributed to various Amazonian and Andes indigenous communities and has collaborated with international organizations including the Wildlife Conservation Society, Care and The Nature Conservancy establishing economic opportunities for local people with products from the forest. Rocίo is renowned and beloved. She practices and teaches about shamanic healing ceremonies, knowledge coming from her mother and grandmother's lineage, from the Andes Mountains in Ecuador. Her interests are the practices with Master plants and the techniques of healing ceremonies in Ecuador, the in-depth understanding of plants that are food and medicine and the recovery of local traditions about master plants.